"We started off with some light indecision served with a side platter of confusion: ramen is cheap, but Yusho is not." 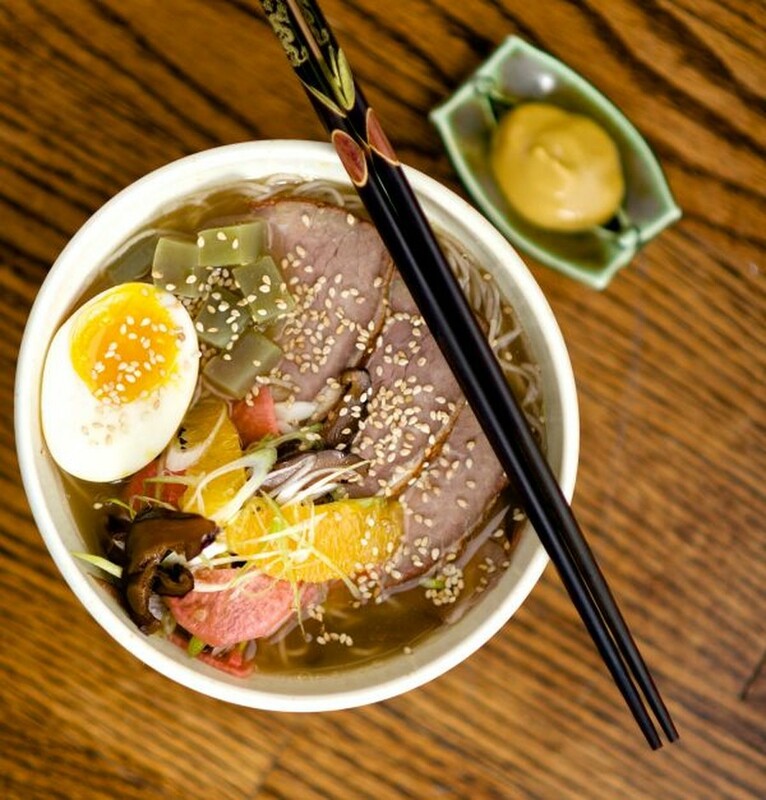 Hyde Park’s most recent addition to the block, Yusho, is making waves out of their skinny ramen noodles as a trendy and tasty dining option. This is primarily because Yusho is not your typical neighborhood go-to; the restaurant is a baby branch off of the Avondale hotspot on the North Side. Esteemed chef Matthias Merges, specifically of Charlie Trotter fame, created Yusho as a way to challenge himself after 17 years in fine dining by focusing on Japanese street food. After colossal success in Avondale, he brought what has been adoringly nicknamed “Baby Yusho” out of the city and into the heart of Hyde Park, right on East 53rd Street. Yusho has been a hot topic recently because it has ruffled the locals as the first establishment on East 53rd Street to take advantage of the recent raising of the dry ban, and in fact, was the catalyst for the petition that made that change. Take a break from BYOB; Yusho is proud to say they have a fully stocked bar in a formerly dry area. But aside from that, perhaps Yusho has become such a buzzword simply because the food is good, the seating is trendy, and it’s this month’s novelty. Always busy from Thursday nights on, everyone has either been there for some noodles or is planning to go. Last weekend I popped in out of curiosity to find the place packed. Then, without reservations about the wait or the new food venture, my boyfriend and I decided to make it a date night. Evidently his Econ professor and his wife had a similar idea. We sat in the midst of a crowd: this lovely couple, other friends catching up, and some local families relaxing with an early Sunday night dinner—quite a coming together of the Hyde Park residential neighborhood, all in the hopes of discovering a new haunt. Low-lit, yet bright and welcoming, Yusho’s small pops of color burst with modern minimalism, yet this modernity is countered with some rustic, wooden flair and simplistic taste. The booths are long and the two-tops are intimate but casual enough for platonic bun sharing. It’s almost too put-together and trendy for Hyde Park. Perhaps this makes it more of a welcome addition in the neighborhood, giving it a unique advantage to the Asian food scene around East 55th Street and East 57th Street. We started off with some light indecision served with a side platter of confusion: ramen is cheap, but Yusho is not. One of the entrées is indeed called “12-buck ramen,” and I must say after ordering the dish, which turns out to be an Asian fusion take on matzo ball soup, I was impressed. However, impressiveness is not always worth $12. If we had stuck with just ramen bowls, I think it would have been a deal. But although the advertised "small plates" sounded so tantalizing, it ended up being quite pricey. My one regret, all in all, to a very nice dinner, was getting the fries instead of the buns. The poutine-esque fries came recommended, and my boyfriend is all about gravy, but they weren’t as memorable as first advertised. Buns, however, are forever my favorite, and one of the staple menu items of Yusho. Our other appetizer was grilled chicken satay, served with the perfect blend of spice and flavor. One interesting thing to note was the cold ramen bowl—an odd choice, but proven worth the risk. It was just as hearty despite lacking the comfort of warmth. It also included an interesting twist: salmon-roe popping bubbles. They taste and look like your favorite bubble tea cop-out of tapioca, but they’re pretty fishy, and completely delicious. You can’t go wrong with ramen bowls; that’s a fact known by all college students. Whether you’re willing to spend over $12 plus tip for this dish is up to you, but Yusho is the place to try it with a little bit of unique flair and a lot of cool ambience.